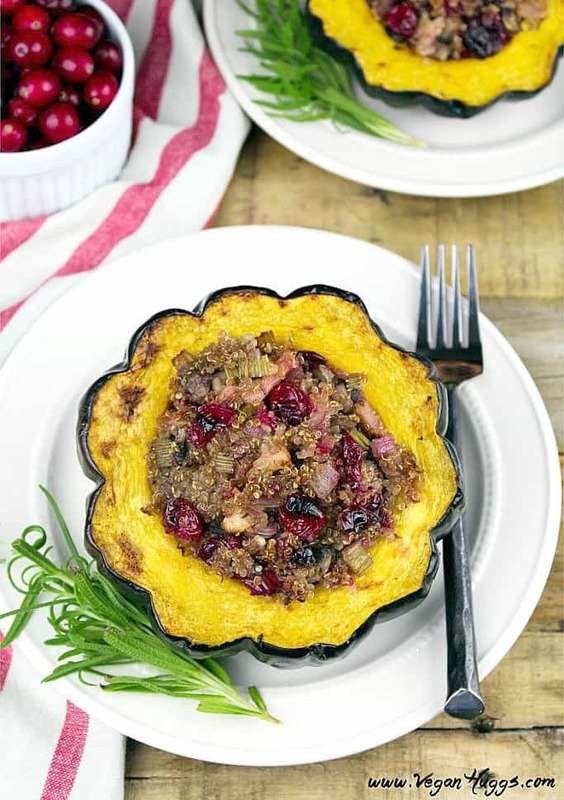 Quinoa Stuffed Acorn Squash ~ an all-in-one meal that’s bursting with fall flavors. 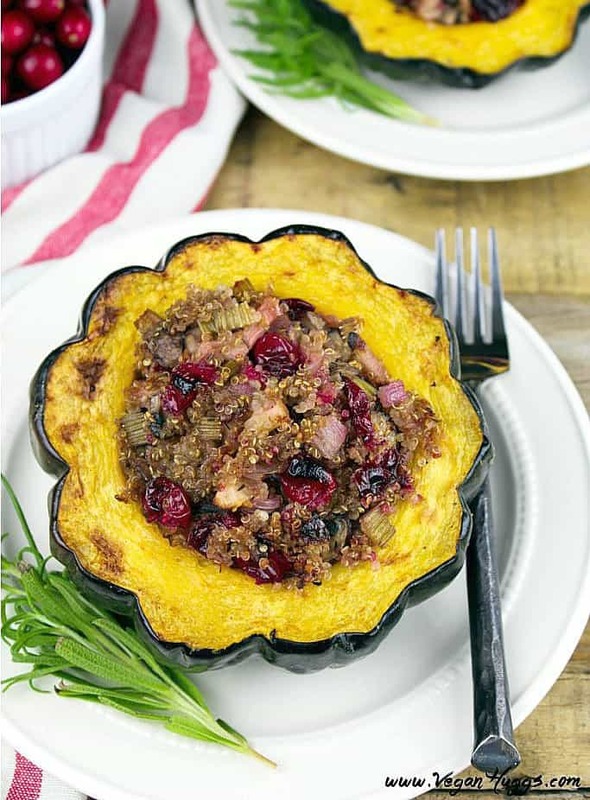 Acorn squash is one of my favorite autumn vegetables! They’re so beautiful on the outside and have a subtly-sweet, nutty flavor on the inside. I cook with them all season long. 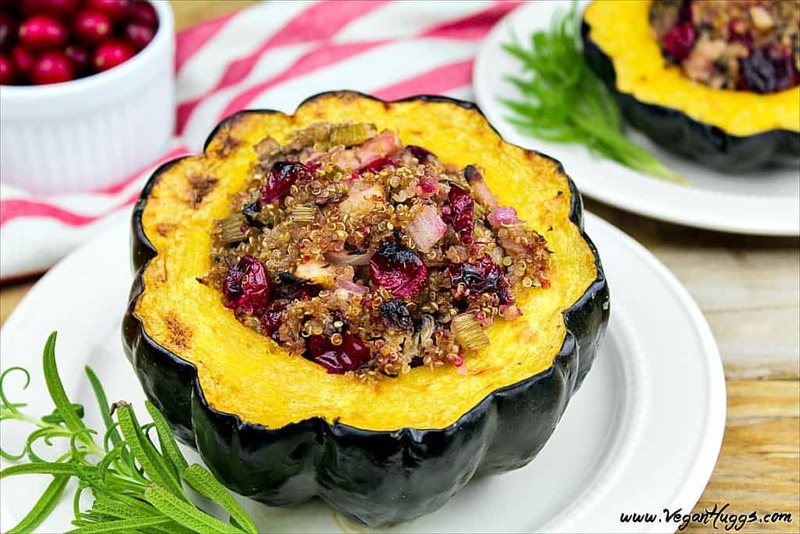 My favorite is this Quinoa Stuffed Acorn Squash. It’ s filled with so much savory flavor from sautéed onions, celery, mushrooms, and warm spices. Then it’s balanced out with subtle sweet and tarts flavors from apples and cranberries. The quinoa gives it a nice texture and lots of added protein. It’s heavenly! It really is a complete meal, but sometimes I’ll serve it with Vegan Cauliflower Soup and a side salad. I also make it for Thanksgiving as a main dish along with my Meatless Loaf. Then my guests can decide which they prefer. How do you cut an acorn squash? First, you have to cut them using a very sturdy and sharp Chef’s Knife. Put the squash on its side and cut a thin slice off the bottom to create a flat edge, so the squash can stand up. Be careful not to cut too much or it will leave a hole in the bottom. You may not need to cut the top of the squash, but if it has a protruding stem, you’ll need to cut it off. If the stem is very short, see if the squash will lay somewhat flat before cutting. Now cut each squash horizontally in half. Scoop out the membranes and seeds inside and discard. Or you can save the seeds for roasting if desired. They are delicious! 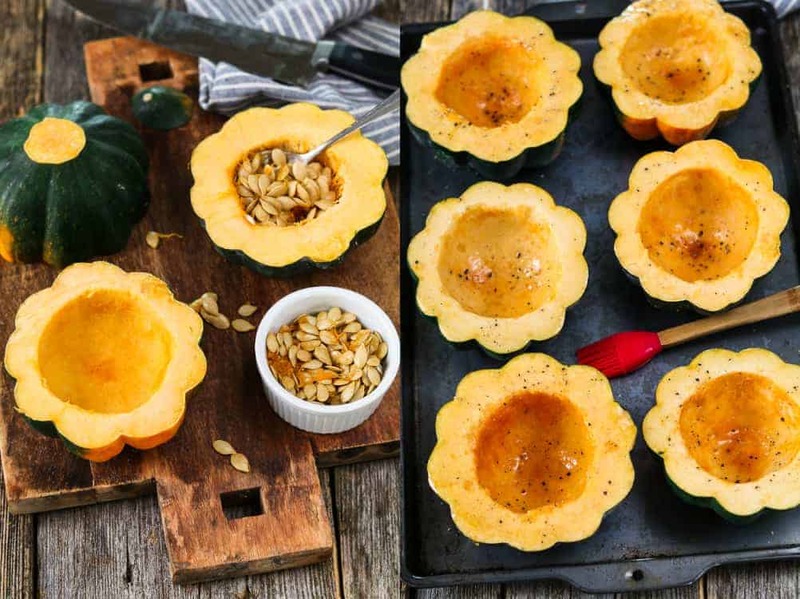 How do you roast acorn squash? It’s really easy once the squash is prepped. Just preheat your oven to 425°F (218 °C). Place the squash on a rimmed baking sheet cut-side up. Brush the inside and top with olive oil and sprinkle with salt and pepper. *Optional: lightly brush with maple syrup to add a subtle sweetness. It’s good! Now roast for about 35-45 minutes or until the squash is fork tender. Rotate pan mid-way through for even cooking. Cook the quinoa in low-sodium vegetable broth for extra savory flavor (not pictured). Remove from heat and set aside while you sauté everything else. Sauté the onion, celery, and apple in a large pan until softened for about 5-6 minutes. Add the mushrooms, cranberries, garlic, sage, thyme, cinnamon, salt, and pepper. 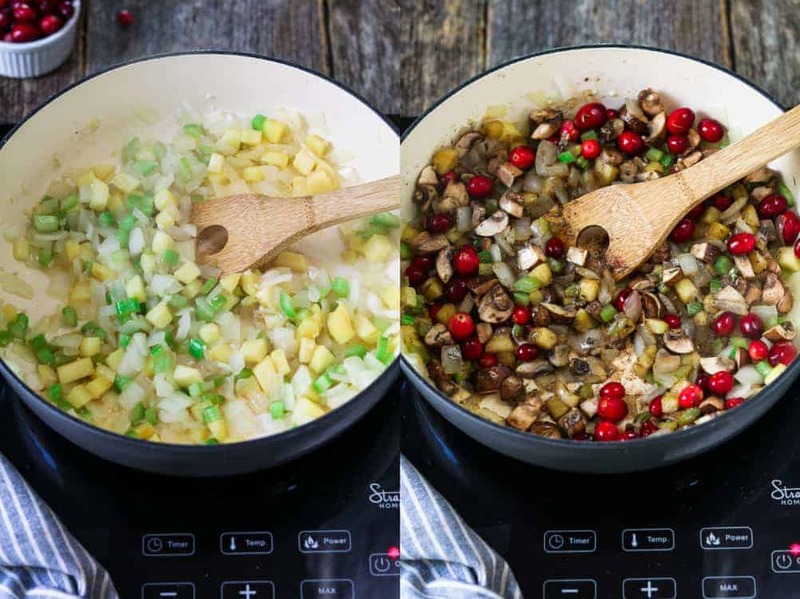 Sauté about 7-9 minutes or until mushrooms and cranberries are tender. If food starts to stick to the pan, you can splash a little vegetable broth or white wine to deglaze. Remove from heat and add the cooked quinoa. Combine well and taste for seasoning, add more if needed. 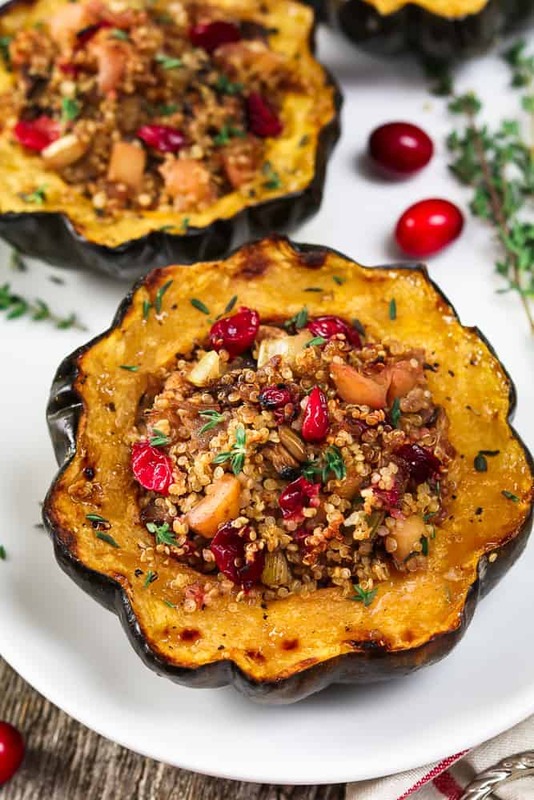 When the squash is fully roasted, fill with the stuffing mixture using a large spoon. (optional: drizzle/spritz top of stuffing with oil for a crispier top). 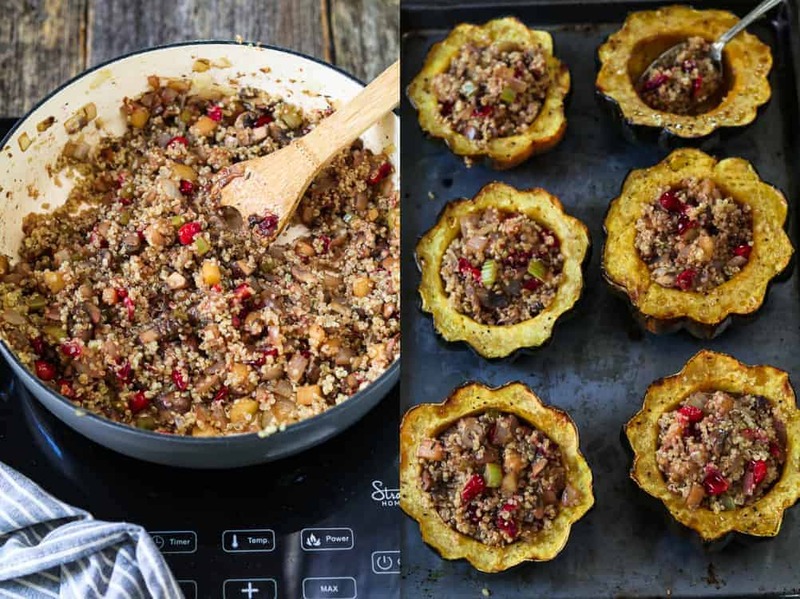 Place in the oven and bake 10-15 minutes, until the quinoa is lightly browned & crispy. Can it be made ahead? Absolutely, they are perfect for make-ahead meals. Make them as instructed, but skip the last step of putting them back in the oven (fully stuffed). Instead, stuff them and place them in a sealed container in the fridge (let them cool down first). To reheat, cover them in foil and pop in the oven until thoroughly heated. Remove foil for last 10-15 minutes to crisp up the top. You can freeze them for about 2-3 months too. Just make sure they are sealed well to avoid freezer burn. 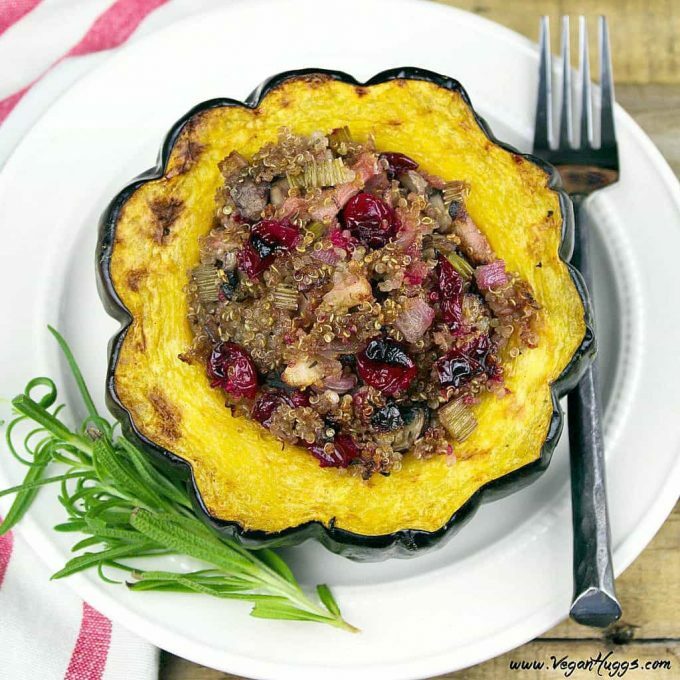 So, are you ready to enjoy this fall-fabulous meal? Let’s do this! If you make this recipe, let me know what you think by ★ star rating it and leaving a comment below. It would really make my day. You can also follow me on Instagram and share your creation with me. Just tag me @veganhuggs and hashtag #veganhuggs so I don’t miss it. 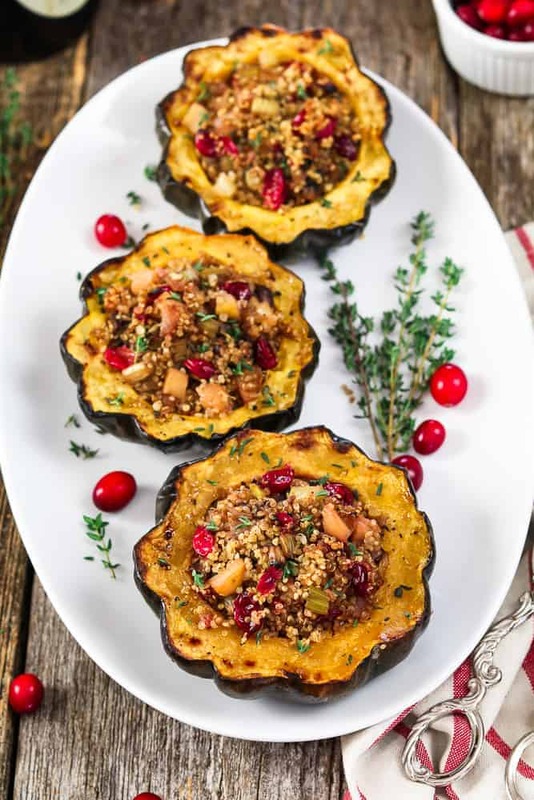 Quinoa Stuffed Acorn Squash ~ an all-in-one meal that's bursting with fall flavors. Place the squash on a rimmed baking sheet, cut-side up. Brush the inside with olive oil and sprinkle with salt & pepper. (*Optional: lightly brush with maple syrup to add a subtle sweetness) Roast the squash for about 35-45 minutes, or until tender (test with a fork). Add the quinoa and broth to a medium pot. Bring to a boil and then turn heat down to maintain a low simmer. Cover with lid and cook until liquid is gone and quinoa is fluffy. This usually takes about 15-20 minutes to cook. Remove from heat and fluff with fork. Set aside. Add the mushrooms, cranberries, garlic, sage, thyme, cinnamon, salt, and pepper. Sauté about 7-9 minutes, or until mushrooms and cranberries are tender (if food sticks to the pan, you can splash a little vegetable broth or white wine to deglaze). Remove from heat and add the cooked quinoa. Combine well and taste for seasoning, add more as needed. When the squash is ready, fill with the stuffing mixture. (*optional: drizzle/spritz top of stuffing with oil for a crispier top). Place in oven and bake 10-15 minutes, until the quinoa is lightly browned & crispy. This recipe is very versatile, so feel free to add your favorite ingredients. I make this with vegan sausage too. I crumble up 1 link and add it after the onions, celery and apples have cooked. I lightly brown them (a touch more oil might be needed) I leave out 1/2 of the mushrooms from the recipe. I recommend Field Roast - Smoked Apple Sage flavor. 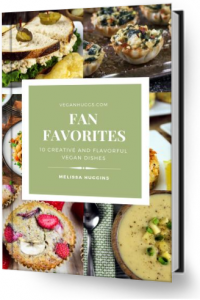 I plan to make this for a family late holiday meal for the veggies in the fam… I feel silly asking this question but no one has commented yet which makes me think I should know this, but don’t. Is the skin edible? These look so good. I want to make them for a dinner party. About how long does it take to warm them, if a make ahead and refrigerate? I tried this today (testing for Thanksgiving) and it was easy and delicious! I am doing low fat vegan and didn’t do any oil and it was great without it. I will be taking to my family’s non-vegan dinner for me to eat and will NOT feel cheated!!! LOL! Invited a friend over for dinner tonight & made this.It was very good! I substituted a peach for the apple & raisins for the cranberries & did not have thyme , & added a tablespoon of maple syrup to the stuffing. Still delicious! Thank You for this recipe And perfect that it is gluten free, since I have to be gluten free. Would these freeze well if I made a bunch? This was so awesomely easy and delicious smelling!! btw- if you didnt already know- I found out early on, from my very own kitchen play-school 😛 that Fennel IS THE TASTE of sausage. Dinner time is not coming quickly enough at my place, folks!! Thanks for your 5-Star Hit, Miss Huggins! Hi Caty! Thank you for making it! I’m so happy you liked it. It sounds perfect with sliced almonds, fennel, and rosemary. I love fennel but don’t use it enough. You’ve inspired me!!! 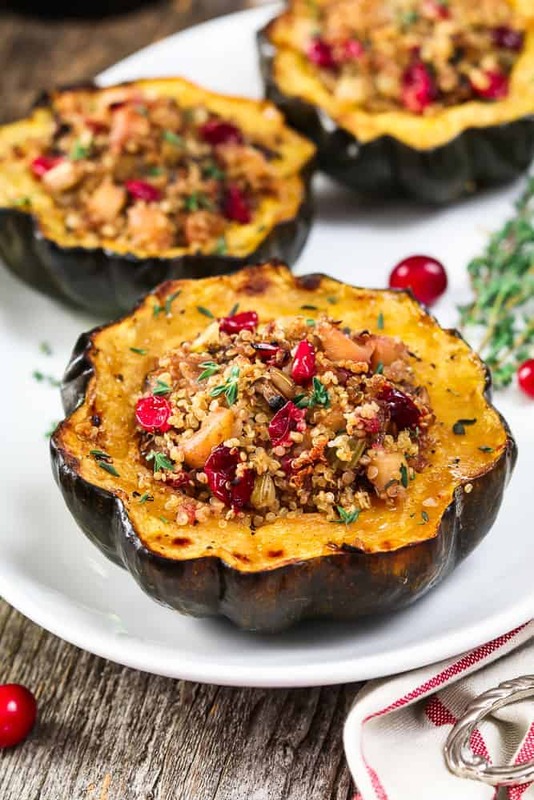 OMG its so good- I bought another Acorn Squash (at full price mind you) JUST to make another one for myself with the leftover stuffing…. …… This could be a never-ending enjoyment…. My house has never smelled so good!! This is such a delicious recipe thank you for sharing! Are the herb amounts for dried or fresh? I’m so making this for Tgiivng – looks amazing! Made this last night, with a few adjustments. The stuffing reminded me of my Mom’s stuffing, so instead of adding cranberry, I added raisins. I also added sauteed and crispy maple flavored tempe instead of the quinoa. It was Fantastic! I look forward to making it many times this Fall and Winter. We are making a glaze to go over the top of it. Last time it was a balsamic vinegar glaze, this time it is a grape jelly and mustard glaze. This recipe is so good! I added some maple syrup to it and it’s amazing! This recipe is to die for! Honestly all of your recipes have changed our home! My husband brought me to eat at a really nice restaurant on our anniversary and since I’ve become a more picky eater. I’ve gone through probably half of your dinners so far, on repeat. I don’t even question anymore, I just buy the ingredients and it always turns out mouthwatering. Thank you for sharing your wonderful creations! What a beautiful recipe. I could make my whole meal out of this. 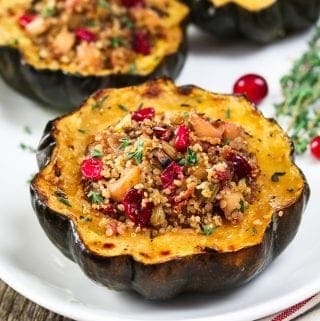 I love stuffed squash, and this looks so perfect for Thanksgiving! This looks so good! Perfect entree for Thanksgiving supper.